It’s all about building a community and focusing on customer engagement! We’re more than happy to launch an app for this popular online-store building tool. The Muut Shopify app offers you the ability to add gorgeous real-time discussions to your Shopify store and gives any visitor the opportunity to interact with customers, followers… and you! The biggest challenge for you as an ecommerce store owner is building trust between your brand and your customers. As you may know, it’s proven that product reviews or any comments (even negative ones) influence online customers’ decision to purchase. Make reviewing accessible, easy and fun! This app can be used to embed real-time commenting on blog posts, store products, or any other type of article, as well as use a full-fledged forum system. Each member of your community can also use their existing customer account to start or join a conversation. Design also plays a big role in influencing people’s perception of a website’s credibility. Visitors and customers can identify you by your name, but they must become familiar with your theme and the overall look of your online store. So embedding our discussion platform is truly seamless, with styles being automatically pulled from your store’s theme; it can be customized further using our visual editor or by modifying a stylesheet directly in your store’s theme. It’s time to play with new templates and other liquid tags, that will simply tell them what to do. Feel free to check our documentation or ask what else we can do to help. And what about cool real-time widgets? Real-time discussions offer new ways to communicate. So different widgets will also help any users to keep track on their own activity and that from the other members of your community. They will enable you to understand and build a better community; and boost your sales! This widget displays the current users’ Muut Feed, that is to say all the discussions they’ve joined,posts they’ve made, and threads they are subscribed to. The best way for each member to find their different exchanges with the others or keep sharing their experience before and after a purchase. You can use the Online Users to show who is currently logged in and how many other people are viewing the site. You could easily identify your regular visitors or contributors. And remember,users' portraits appear on the fly as they sign in to join the discussion! It keeps track of which posts have received the latest comments and who made them. All the users on your website can see it update in real-time as they participate in the discussions on all your posts. It shows which posts have received the most comments and likes so far. New blog posts or products pages get people excited and make longtime customers renew their interests in your community. This widget helps you to identify the most discussed topics in real-time, guiding your editorial choices for the future. You can embed a single channel at a specific location on a page by using this widget. Users can watch and join the discussion. For example, if you have a idea for a new product, you can create a single channel to ask your customers their opinion. When you make changes on your store, this widget can also encourage people to give their feedback or report any errors that they see. Give our new Shopify app a try! 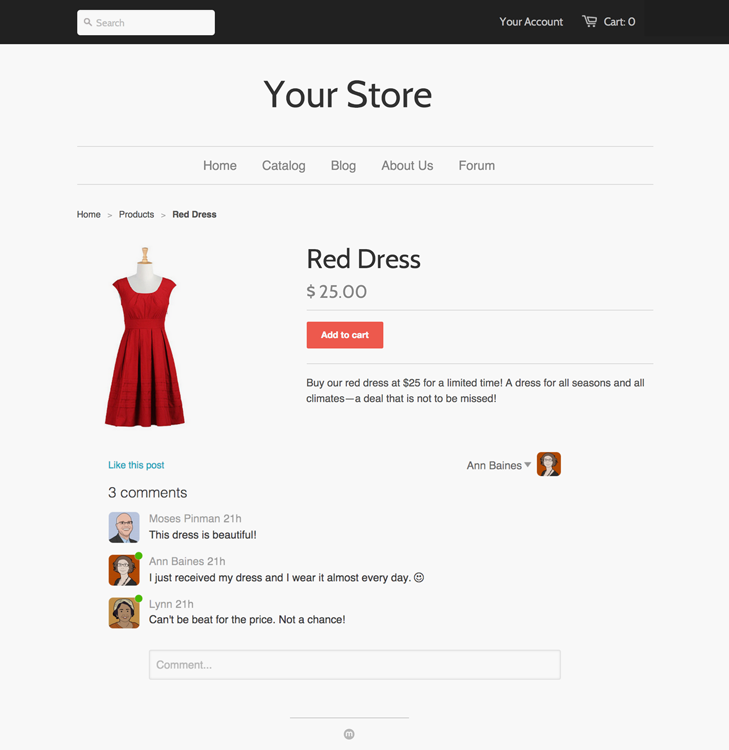 The Muut Shopify App gives you a chance to interact with your customers. You will learn more about their interests, their expectations. So you can improve your products or sell them in a more efficient way, while bringing them constantly closer to your brand! Shopify App is part of our Small and Medium plans. The app has a 14 day trial so you can play with it in your store before having to be a full subscriber. Whether you already have a trial going, are an existing Small/Medium subscriber, or are new to Muut altogether, you can start setting up the app by installing it from the Shopify App Store. You can check out our full documentation here!